High dividend stocks appeal to many investors living off dividends in retirement because their high yields provide generous income. Many of the highest paying dividend stocks offer a high yield in excess of 4%, and some even yield 10% or more. However, not all high yield dividend stocks are safe. 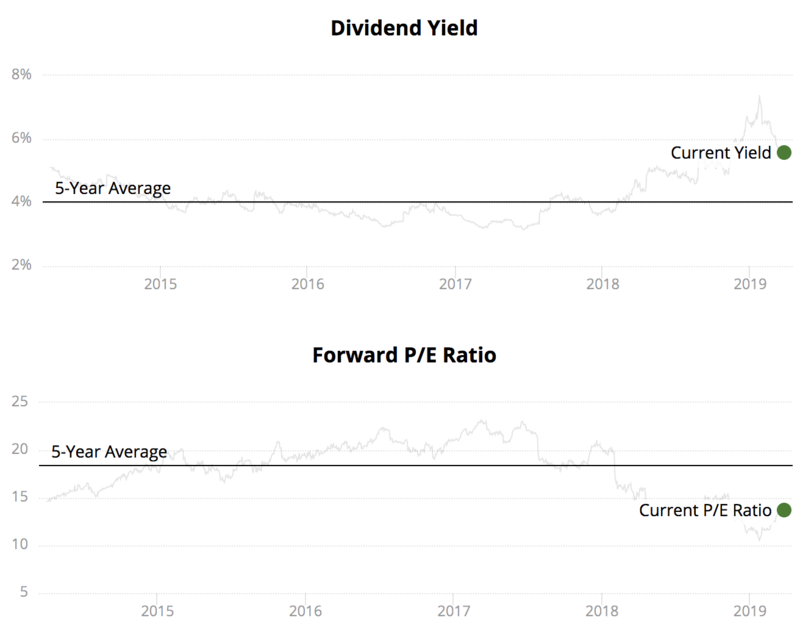 Let’s review what high dividend stocks are, where stocks with high dividends can be found in the market, and how to identify which high dividends are risky. At the end of the article, we will take a look at 21 of the best high dividend stocks, providing analysis on each company. 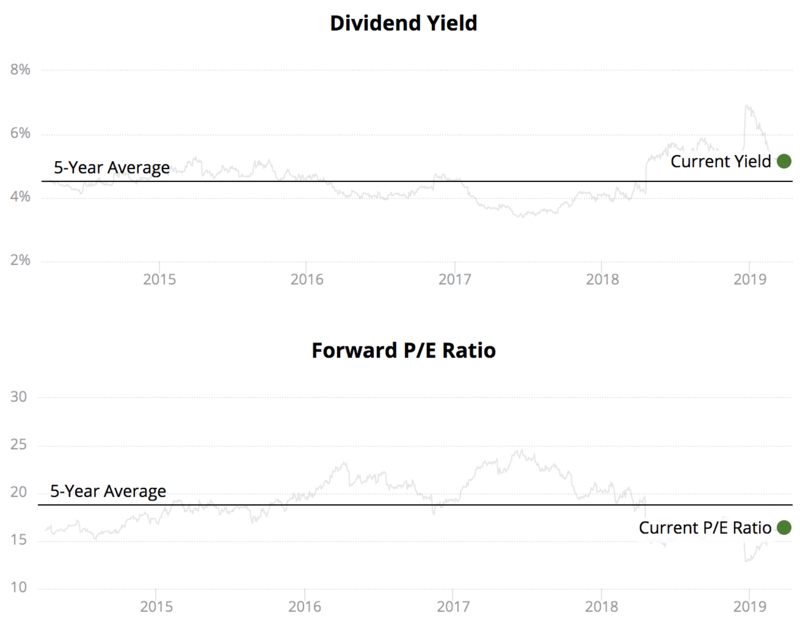 Almost all of these high yield stocks offer a dividend yield greater than 4%, have increased their dividends for at least five consecutive years, and maintain healthy Dividend Safety Scores. The market’s strength has reduced the number of safe dividend stocks with high yields, but there are still several dozen worth reviewing. By the way, many of the people interested in high dividend stocks are retirees looking to generate safe income from dividend-paying stocks. If that sounds like you, you might like to try our online product, which lets you track your portfolio’s income, dividend safety, and more. You can learn more about our suite of portfolio tools and research for retirees by clicking here. What are High Dividend Stocks? Why 4%? 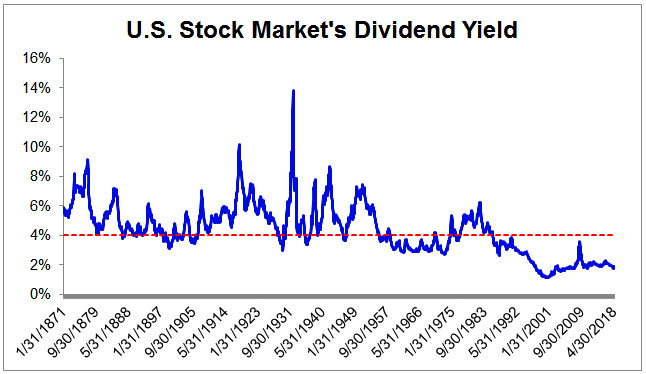 Well, the chart below shows the U.S. stock market’s dividend yield since 1871. You can see that the stock market’s dividend yield has remained well below 4% for most of the last 25 years. In today’s era of record-low interest rates, a 4% dividend yield is relatively high. In fact, it is about twice as high as the market’s dividend yield today. 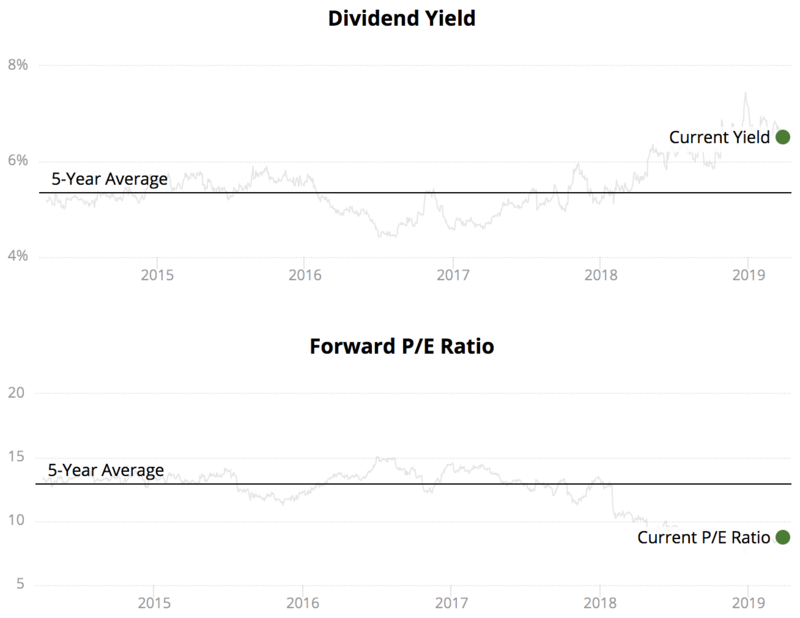 A 4% dividend yield is also a sensible cutoff to use for investors who are funding their retirements primarily with dividend stocks rather than the traditional 4% withdrawal rule. Regardless, why do some dividend-paying stocks offer much higher yields than others? As you might have guessed, there are many different possible answers. In some cases, a high yield reflects a company’s mature status. Since the business has relatively few profitable growth investments it can pursue, it returns most of its cash flow to shareholders in the form of dividends. Utilities and telecom companies would be good examples. 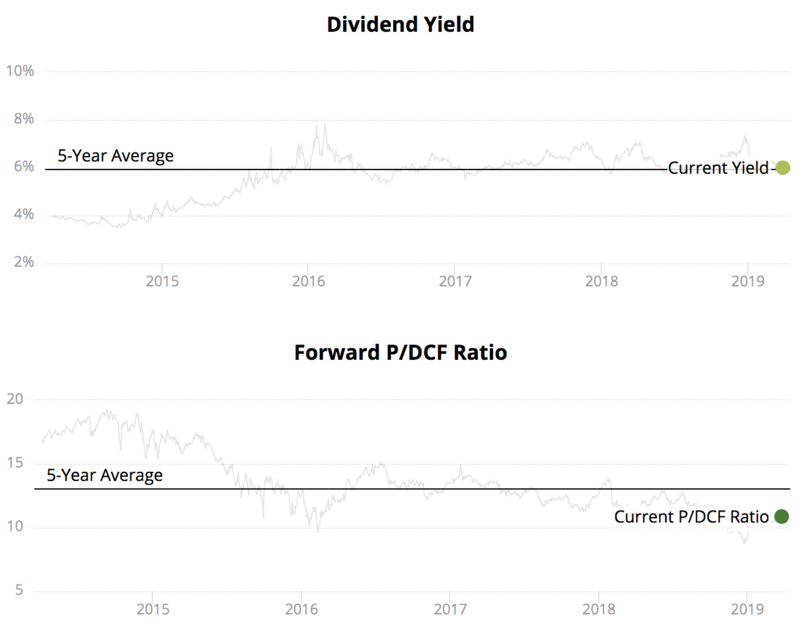 Other high dividend stocks have unique business structures that require them to distribute most of their cash flow to investors for tax purposes. Some stocks with high dividends are able to offer generous payouts because they use financial leverage to magnify their profits. And then there are high yield stocks that have landed on hard times. Unfavorable business conditions have reduced their cash flow to the point where investors no longer believe their dividends are sustainable. In these instances, the high yield is a mirage. Let’s take a closer look at where yield-hungry investors can hunt for high dividend stocks. Many different types of high dividend stocks exist in the market, and each type possesses unique benefits and risks. Real Estate Investment Trusts (REITs): REITs were created in the 1960s as a tax-efficient way to help America fund the growth of its real estate. Like MLPs, REITs are pass-through entities that pay no federal income tax as long as they pay out at least 90% of their taxable income as dividends. There are over a dozen different types of REITs (e.g. apartments, offices, hotels, nursing homes, storage, etc. ), and they make money by leasing out their properties to tenants. Their high payout ratios and generally stable rent cash flow make them a very popular group of higher dividend stocks. Master Limited Partnerships (MLPs): MLPs were created by the government in the 1980s to encourage investment in certain capital-intensive industries. Most MLPs operate in the energy sector and own expensive, long-lived assets such as pipelines, terminals, and storage tanks. Many of these assets help move different types of energy and fuel from one location to another for oil & gas companies. MLPs can pay high dividends because they do not pay any income taxes (you pay taxes on your share of the MLP’s income instead), pay out almost all of their cash flow in the form of cash distributions (the MLP equivalent of corporate dividends), and generate fairly predictable earnings in many cases. Business Development Companies (BDCs): BDCs were created in 1980 and are regulated investment companies. They are basically closed-end investment funds that are structured similarly to a REIT, meaning they avoid paying corporate taxes if they distribute at least 90% of their taxable income in the form of dividends. There are many different types of BDCs, but they ultimately exist to raise funds from investors and provide loans to middle market companies, which are smaller businesses with generally non-investment grade credit. Roughly 200,000 of these businesses exist, and large banks are less likely to lend them growth capital, which is why BDCs are needed. Closed-end Funds (CEFs): closed-end funds are a rather complex type of mutual fund whose shares are traded on a stock exchange. Its assets are actively managed by the fund’s portfolio managers and may be invested in stocks, bonds, and other securities. The majority of CEFs use leverage to increase the amount of income they generate, and CEFs often trade at premiums or discounts to their net asset value, depending largely on investor sentiment. 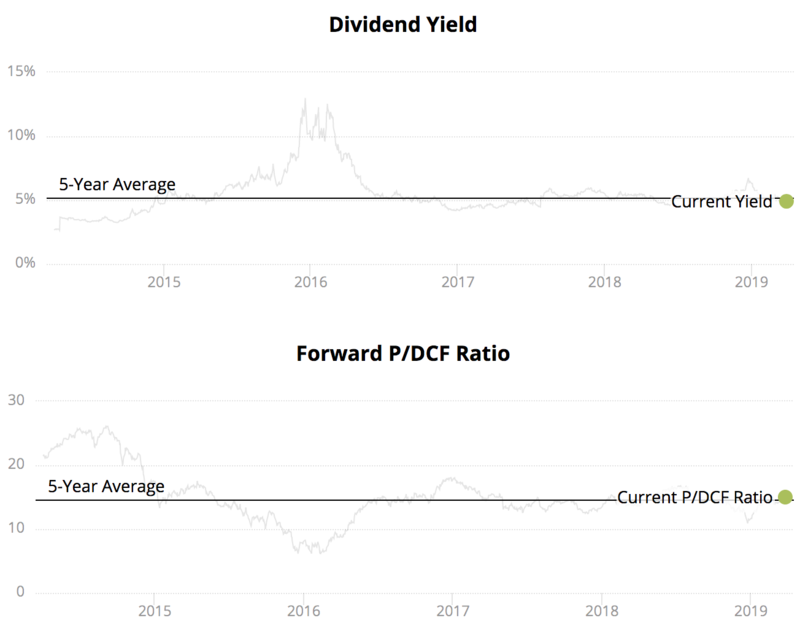 YieldCos: a relatively new class of high dividend stocks, YieldCos are pass-through entitles that purchase and operate completed renewable power plants (e.g. wind, solar, hydroelectric power), selling the clean energy they generate to utility companies under long-term, fixed-fee power purchase agreements. Utilities & Telecom Sectors: utility and telecom companies are generally mature businesses with low growth rates. As a result, many of them return the majority of their cash flow to shareholders in the form of dividends, resulting in attractive yields. After reading through the different lists above, you might have noticed that most high dividend stocks are not your basic blue chip corporations like Coca-Cola (KO) and Johnson & Johnson (JNJ). Instead, many of them have unique business structures and risks to consider. Take REITs and MLPs, for example. Since these high yield stocks distribute almost all of their cash flow to investors to maintain their favorable tax treatments, they must constantly raise external capital (i.e. debt and equity) to grow. Realty Income (O), one of the best monthly dividend stocks, has nearly tripled its shares outstanding since 2008, for example. On the other hand, a business like Johnson & Johnson can use the free cash flow it generates to pay dividends while still retaining plenty of funds to reinvest in new projects, growing earnings and dividends along the way (without needing to issue equity or new debt). Since REITs and MLPs need to issue debt and sell additional shares to raise the money they need to keep growing their capital-intensive businesses (buying real estate and constructing pipelines isn’t cheap), they face additional risks compared to basic corporations. If access to capital markets becomes restricted or more expensive (e.g. rising interest rates; a slumping share price), such as what happened during the financial crisis, these types of high dividend stocks can suddenly be very vulnerable. Kinder Morgan (KMI), the largest pipeline operator in the country, is perhaps the most notorious example in recent years. The company slashed its dividend by 75% in late 2015 as outside financing became too costly, forcing the company to pick between investing for growth and maintaining its dividend. Ferrellgas Partners (FGP), a major retail distributor of propane, is another example of the risks certain high dividend stocks can pose. While the MLP had been in business for more than 75 years and paid uninterrupted dividends since 1994, it stunned investors by slashing its distribution by more than 80%. Ferrellgas Partners took on too much debt to diversify its business in recent years, and mild winter temperatures drove down propane sales, causing a cash crunch. Simply put, high payout ratios and high financial leverage elevate the risk profile of many high dividend stocks. A seemingly stable company can become dangerous in a hurry if unexpected hiccups surface. In addition to their dependence on healthy capital markets, certain high dividend stocks such as REITs and MLPs also face regulatory risks. For example, if Congress decided to change the tax treatment for MLPs, those businesses might not be able to avoid double taxation. BDCs and CEFs contain their own unique risks, too. By employing meaningful amounts of financial leverage to boost income, any mistakes made by these high dividend stocks will be magnified, potentially jeopardizing their payouts. If something appears too good to be true, it often is (eventually). Not surprisingly, many of the highest paying dividend stocks can also be value traps. GameStop (GME) is one example. The company has been in business since 1994 and operates thousands of retail stores that primarily sell new and used video game hardware and accessories. GameStop is a basic corporation, not a REIT or MLP, but its stock still yields more than 6%. However, the company appears to be more of a value trap than a high yield bargain. GameStop’s sales have struggled in recent years as customers have increasingly favored digital game downloads, and the company’s profitability is steadily deteriorating. Management has taken on increasing amounts of debt in an effort to diversify the company into more attractive markets, but the clock is ticking on its turnaround. If results aren’t delivered over the coming years, the dividend will likely be at risk, and the value of the overall company (and your stock) could be significantly diminished. 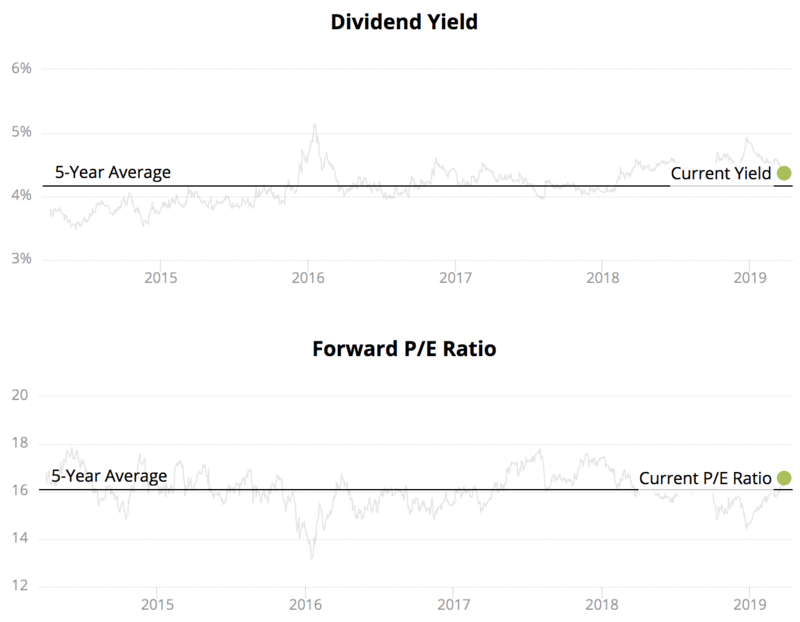 At the end of the day, high yield investors need to do their homework and make sure they understand the unique risks of each high dividend stock they are considering – especially the financial leverage element. Maintaining a well-diversified dividend portfolio is an essential risk management practice. Before piling into REITs, for example, consider that the Real Estate sector only accounts for roughly 3% of the S&P 500’s total value. There are some very good REITs out there, but most things are better in moderation. You just never know what could happen, especially as we potentially begin exiting this period of record-low interest rates. 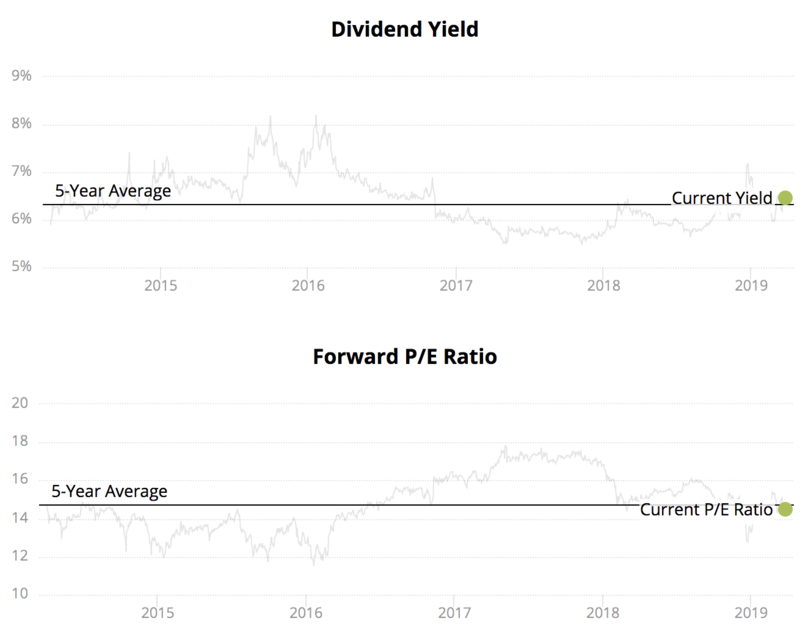 While the risks of owning certain high yield dividend stocks are hopefully clear, there are a number of steps investors can take to pick out the safest ones. First, it goes without saying that you should never buy any investment that you don’t understand. Warren Buffett refers to this concept as staying within one’s circle of competence. Many high yield stocks are unfortunately just too complicated for me to own them in my dividend portfolio. Once you have identified a stock that you understand fairly well, you need to evaluate its riskiness. Some of the biggest risk factors to be aware of for a stock are: (1) the industry it operates in; (2) the amount of operating leverage in its business model; (3) the amount of financial leverage on the balance sheet; (4) the size of the company; and (5) the current valuation multiple. Collecting the information needed to gauge how risky a high yield dividend stock is can be a time-consuming process. That’s one reason why we created Dividend Safety Scores, which scrub through a company’s financial statements to evaluate the safety of its dividend payment. 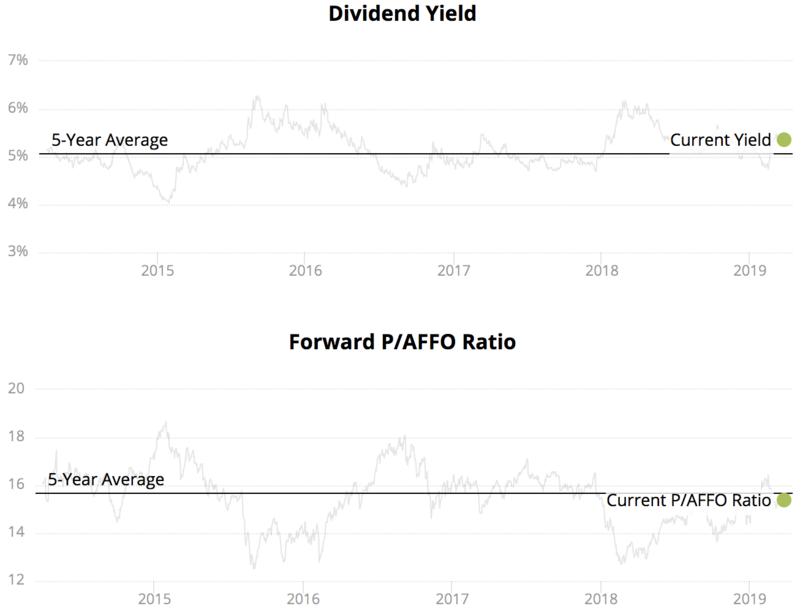 Dividend Safety Scores can serve as a good starting to point in the research process to steer clear of high yield traps. Scores range from 0 to 100, and conservative dividend investors should stick with firms that score at least 60. 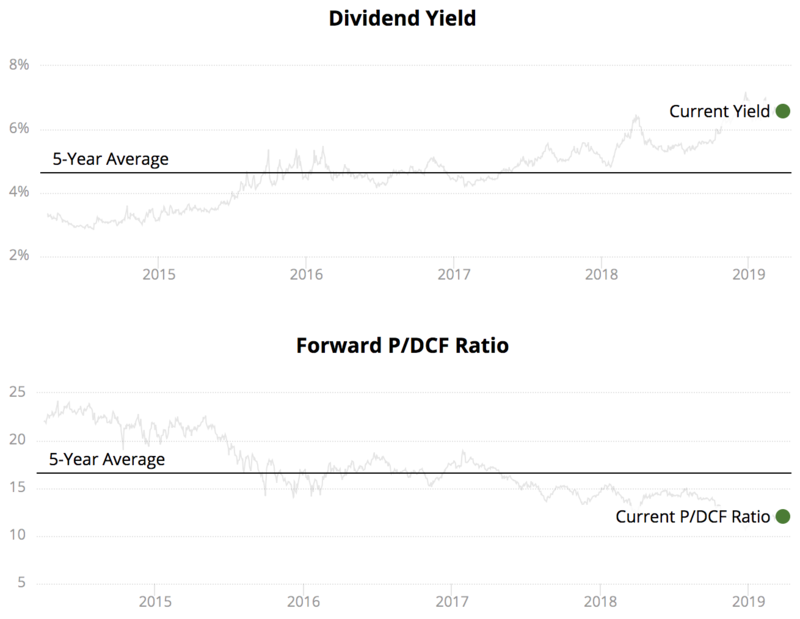 Since tracking the data, companies cutting their dividends had an average Dividend Safety Score below 20 at the time of their dividend reduction announcements. Investors can learn more about how Dividend Safety Scores work and view their real-time track record here. We used our Dividend Safety Scores to help identify the high dividend stocks that are reviewed in detail below. In this list, we analyzed 21 of the highest paying dividend stocks in the market. 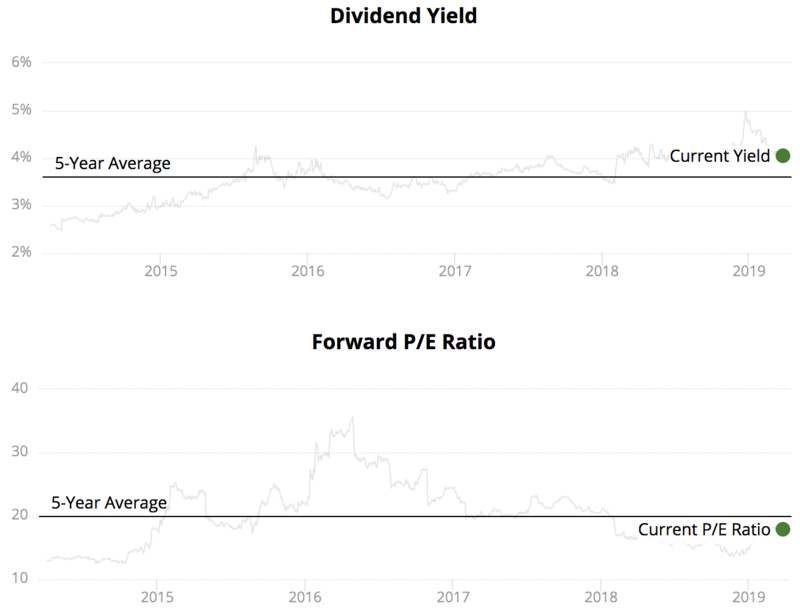 All of these companies offer a high dividend yield of 4% or higher, have increased their dividends for at least five consecutive years, and score average or better for Dividend Safety. The list is sorted by dividend yield from low to high, and our analysis is updated monthly. ExxonMobil was founded in 1870 and is one of the world’s oldest oil companies. It’s also the world’s largest publicly traded integrated oil conglomerate, with nearly 30,000 oil & gas wells on six continents. The company operates in three distinct business segments: upstream oil & gas production, downstream refining, and specialty chemicals. ExxonMobil’s greatest strengths are its scale, diversification, and conservative management team. The firm's size is impressive. Exxon's current total liquids production of 3.8 million barrels per day (bpd) exceeds all but seven countries' daily oil production rates, for example. Such scale helps Exxon achieve lower costs, which is essential in a commodity market. The company’s integrated business model also provides some cash flow diversification, helping it ride out energy cycles with somewhat less volatility than most of its rivals. Exxon’s management team has a long track record of excellent capital allocation, which has helped the company enjoy higher returns on capital than all of its major peers. Exxon has paid an uninterrupted quarterly dividend since 1882 and has increased its payout for more than 30 consecutive years. While Exxon’s dividend grew nearly 9% annually over the past decade, payout growth has slowed in recent years thanks to the crash in oil prices. The company is still able to implement low to mid-single-digit dividend increases for now, including a 6.5% boost announced in April 2018, and cash flow from operations and asset sales now exceeds the company’s dividend, providing some more breathing room. If energy prices remain depressed, Exxon will arguably be the last company still standing and paying dividends. Verizon is the largest wireless services provider in the country and provides 4G LTE coverage to over 98% of the country’s population. Verizon has more than 118 million wireless retail connections, 6.0 million Fios internet subscribers, and 4.5 million Fios video subscribers. In 2018, Verizon was the most profitable company in the telecommunications industry worldwide. Verizon’s business can be broadly classified into two categories – wireless operations (88% of EBITDA) and wireline operations (12%). The company is also expanding into fast-growing areas such as the Internet of Things and digital media, which account for less than 10% of sales. Verizon’s moat is in the form of a large subscriber base and valuable telecom spectrum. The company’s leading investments in its network have helped it consistently score the highest in wireless reliability, speed, and network performance compared to its peers AT&T, Sprint, and T-Mobile. While the industry is intensely competitive, Verizon’s advanced network technologies and leading network coverage help it maintain its huge subscriber base. Verizon’s revenue stream is also regular and reliable since it is engaged in providing a non-discretionary service. There is also little room for new entrants because the telecom industry is very mature. Spectrum licenses are extremely expensive and infrequently available, and there are only so many wireless subscribers in the market to fund these costs. Moreover, huge spending is required to develop new technologies. Verizon has been at forefront of developing 5G wireless technology. Verizon has also made acquisitions to strengthen its wireless offering (bought Vodafone’s remaining 45% stake in Verizon Wireless in 2014) and branch into mobile advertising solutions (acquired AOL in 2015 and Yahoo! in 2017), although its media investments have not worked out. While growth is a challenge, the company’s high dividend remains in good shape. Verizon and its predecessors have paid uninterrupted dividends for more than 30 years while increasing dividends for 12 consecutive years. In 2018 management also announced a $10 billion cost savings plan which it believes will fund the company’s dividend through cash savings in 2022, and U.S. tax reform generated several billion dollars of additional cash flow that was used to reduce debt. Verizon’s dividend has grown by 4.5% per year over the last decade, but annual dividend growth has decelerated to closer to 2% more recently. Going forward, Verizon’s dividend will likely continue growing by 2% to 3% per year. Founded in the early 1900s, Duke Energy has become the largest electric utility in the country. The company’s operations span across the Southeast and Midwest to serve approximately 7.6 million electric customers and 1.6 million gas customers. Regulated electric utilities account for 89% of Duke Energy’s earnings, but the company also has a fast-growing gas infrastructure and utilities business (8%) and a commercial portfolio of renewables (3%). Management sold Duke Energy’s international energy business (which was 5% of earnings) in 2016 to reduce its earnings volatility and focus the company completely on its core domestic operations. Many utility companies are basically government regulated monopolies in the regions they operate in. Almost all of Duke’s utilities operate as sole suppliers within their service territories, for example. The extremely high cost of building and maintaining power plants, transmission lines, and distribution networks makes it uneconomical to have more than one utility supplier in most regions. However, the price regulated utilities can charge to customers is controlled by state commissions. Fortunately, Duke Energy operates in geographic areas with generally favorable demographics and constructive regulatory frameworks. The company’s customer base has consistently expanded by close to 1% per year, and Duke Energy has earned a stable and healthy return on equity between 9% and 11% in each of its regions. With nearly all of its profits generated from core regulated operations, Duke Energy’s business is very safe and predictable with high entry barriers. The company’s recent acquisition of Piedmont Natural Gas will also help it continue shifting towards cleaner forms of electricity generation while also providing more opportunities for growth in natural gas infrastructure. Duke Energy has paid quarterly dividends for more than 90 years and has increased its dividend each year since 2005, including a 4.2% raise in July 2018. The company has increased its dividend by about 2% per year over the last decade, but management recently doubled the dividend’s growth rate to 4% per year to reflect Duke Energy’s lower risk business mix and core earnings growth rate of 4-6% per year. Assuming Duke Energy’s growth projects go as expected, investors should be safe to assume about 4% annual dividend growth the next few years. TELUS is a Canadian telecommunications company that was formed in 1990 by the government of Alberta. The company is the second largest telecom company in Canada and provides a wide range of services, including voice, entertainment, satellite, IPTV, and healthcare IT. In total, TELUS provides services to 9.2 million wireless subscribers, 1.9 million internet subscribers, and 1.1 million TV customers. It also has 1.2 million residential network access lines. Wireless services account for roughly 65% of total EBITDA, with wireline (residential network access lines, internet subscribers, TV subscribers) accounting for the remaining 35% (wireline voice, a declining market, is about 10% of total revenue). Both segments are moderately growing overall. The Canadian telecommunication sector is an oligopoly dominated by three big players – TELUS, Rogers Communication, and Bell. These three companies have strong pricing power and use their scale (i.e. massive subscriber bases and costly network infrastructure) to prevent new entrants coming into the market. The capital-intensive telecom industry also has barriers to entry in the form of a costly, scarce resource – telecom spectrum. Additionally, telecom services are largely recession-resistant and enjoy sticky recurring revenue, providing very reliable cash flow (and dividends) every year. TELUS has increased its dividend consecutively every year since 2004, growing its dividend by 11.9% annually over the past 10 years. 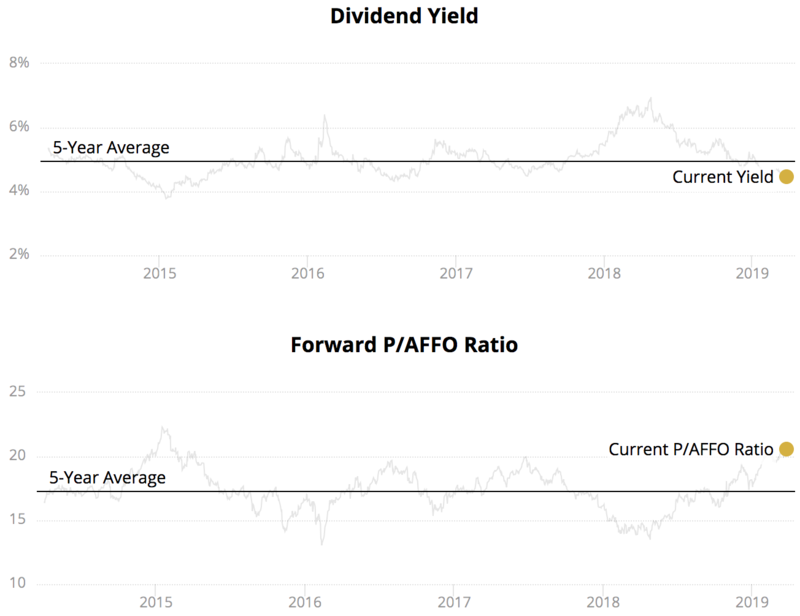 Annual dividend growth has averaged about 10% over the last five years as well. The company has a target to increase dividends by 7% to 10% annually from 2017 to 2019 while maintaining a payout ratio between 65% and 75%, so solid dividend growth is expected to continue for shareholders. Dominion was founded in 1909 and is one of the biggest producers and transporters of energy. The company provides electricity and natural gas to more than 5 million customers located primarily in the eastern United States. Dominion Energy’s $6 billion acquisition of Questar, a Rockies-based integrated natural gas distribution company, gave Dominion better balance between its electric and gas operations while also improving the company’s scale and diversification by geography and regulatory jurisdiction. It’s also worth noting that the company formed Dominion Midstream (DM), a master limited partnership, in 2014 to create a portfolio of natural gas transportation, processing, and storage assets. This further enhanced Dominion’s earnings growth profile relative to traditional regulated utility companies. However, Dominion Midstream came under some pressure after a 2018 regulatory ruling on master limited partnerships that pushed DM’s stock down more than 30% in the week following the announcement. Dominion Energy had planned to drop down substantial midstream assets to Dominion Midstream, using the cash proceeds from the MLP to deleverage. However, as a result of the plunge in Dominion Midstream’s stock price, it no longer was viable for the partnership to issue equity capital, and its ability to raise debt at reasonable interest rates was also uncertain. This created uncertainty over Dominion Midstream’s future, which influenced Dominion Energy’s efforts to deleverage since it may no longer receive as much cash from its MLP as expected (most notably its planned dropdown for Cove Point). In November 2018, Dominion Energy ultimately acquired Dominion Midstream. To continue its deleveraging efforts without the aid of Dominion Midstream, Dominion Energy issued new shares worth about $1.5 billion and pursued non-core asset sales, which management believes will allow the business to achieve its leverage ratio two years ahead of plan and complete its planned equity issuance for 2019. It’s also important to remember that approximately 90% of Dominion’s operations are regulated, allowing it to generate stable earnings and predictable returns on its invested capital. Utility companies can also make for nice high yield retirement investments because they sell non-discretionary services and tend to fare relatively well during recessions (Dominion’s stock outperformed the S&P 500 by 15% in 2008). While Dominion has dealt with some uncertainties in recent years, its dividend growth has been impressive and dependable. The company has raised its dividend every year since 2004, recording 7% annual dividend growth over the last decade. At least mid-single-digit dividend growth seems likely over the coming years as Dominion executes on its large backlog of growth projects. In fact, management remains confident that it will be able to deliver 10% annual payout growth through 2020 as its growth projects start reaching completion in 2018 and 2019. Dominion took many investors by surprise when it announced plans to acquire the South Carolina utility company SCANA (SCG) in a $14.6 billion deal on January 3, 2018. SCANA ran into trouble when regulators decided to consider suspending over $440 million per year in rates that the company charges customers for its failed nuclear reactor units. SCANA and its partner Santee Cooper spent the past decade building these reactors for roughly $10 billion, but the project isn’t even half-finished today. Worse, $9 billion to $16 billion was estimated to be needed to finish the work. As a result, the companies decided to pull the plug on the project. SCANA was being investigated for its handling of construction of the reactors, and regulators were looking at suspending a rate hike that was previously approved to help SCANA collect a portion of the billions of dollars it already spent on this unfinished work (the company continued taking payments). Simply put, SCANA found itself in a position of severe distress. The company’s stock price tumbled nearly 50% until Dominion stepped in with a bid, looking to capitalize on a unique opportunity. The question many investors have now is what they should do with SCANA and Dominion. Dominion is taking a bit of a gamble on this deal but couldn’t pass up the opportunity to acquire a set of otherwise quality assets at a bargain price. In fact, The Wall Street Journal noted that Dominion is paying around $7.4 billion (excluding debt) for a company that would have cost it closer to $14 billion last summer with a similar deal premium. Regulators recently signed off on Dominion’s proposal (SCANA shareholders voted to merge with Dominion in July 2018), lifting away some uncertainty and adding an attractive core utility franchise to the company’s regulated footprint. Specifically, Dominion’s base of regulated electric and gas customers grew by 27% and 40%, respectively. Despite the company’s high payouts and its assumption of SCANA’s debt, Dominion expects the deal to be immediately accretive (i.e. it will boost earnings per share) following its closes in January 2019. Management believes Dominion’s 2017-2020 EPS compound annual growth rate will also rise to at least 8% from a previous range of 6% to 8%, and the outlook for 10% annual dividend growth through 2020 remain intact. Overall, I like the increased scale, diversification, and regulated utility operations that Dominion will enjoy. I also appreciate that the transaction is contingent upon regulatory approval for Dominion’s nuclear solution, reducing some of the risk that SCANA faces, and that management remains committed to deleveraging. I do have some reservations about the unknown liabilities Dominion could be inheriting related to SCANA’s partially-completed nuclear plant, depending on what type of cleanup and restoration work the government might require in the future. It will take years before the outcome of this merger can be judged, so ultra-conservative investors may be better off on the sidelines for now. Dominion Energy’s management team still deserves the benefit of the doubt for now, but the company is certainly dealing with some unexpected challenges (although none of them should jeopardize the dividend’s safety). Welltower is one of the largest medical REITs in America. The company was founded in 1970, and Welltower is involved in practically every aspect of patient care, from hospitals and skilled nursing facilities, to senior assisted living communities and medical office buildings. Welltower’s business segments are long-term post-acute care (11% of operating income), outpatient medical (16%), health systems (7%), and senior housing (66%). The company owns a diversified portfolio of more than 1,600 properties located primarily in major cities across the U.S., Canada, and the U.K.
Welltower makes money renting out its high-quality portfolio of medical properties under long-term contracts to a diverse group of partners, such as Sunrise Senior Living and Revera, which are the companies actually caring for patients. Approximately 94% of its facility revenue is derived from private pay rather than Medicare and Medicaid, reducing its sensitivity to changes in governmental policies. Thanks to its long-term contracts and the essential services provided by its tenants, Welltower has a recession-proof business that generates secure and predictable cash flow (sales grew each year during the financial crisis). An aging American population is the key to Welltower’s growth. In fact, America is expected to see its 75+ year old population double over the next two decades. With an increasing aging population and growing health awareness amongst people, aggregate health expenditures are anticipated to continue rising for the foreseeable future. REITs are very popular with income investors because they are required to pay out almost all of their taxable earnings as dividends. Welltower is no exception and has been distributing uninterrupted dividends since making its first payment in 1971. The company has even increased its dividend in most years throughout its history, growing its dividend by about 3% annually over the past five years and over the last two decades. Welltower’s dividend seems likely to continue growing at a low single-digit pace over the long term, matching growth in the company's underlying cash flow. Brookfield Infrastructure Partners is one of the fastest-growing and most diverse utility companies in the world. The limited partnership (a corporate structure similar to that of a MLP) owns over 30 infrastructure assets, including electrical transmission lines, railroads, ports, natural gas pipelines, toll roads, telecom towers, and natural gas and electricity connections. Most recently, the firm agreed to acquire Enercare, a furnace and water heater provider based in Canada, for about $4 billion, including debt. While Enercare is different from many other businesses in Brookfield Infrastructure's portfolio, the company generates stable, long-term cash flows through equipment rentals to a large and well-established customer base. Brookfield Infrastructure Partners’ healthy diversification by business segment (no business unit is more than 20% of cash flow) and geography helps to ensure very predictable cash flows to secure the safety and growth of its distribution (a tax-deferred form of dividend). That’s especially true since around 90% of the company’s cash flow is secured by either long-term, fixed rate contracts (with annual inflation adjustments) or is derived in regulated industries. The firm has successfully paid distributions since its inception in 2008 and has increased its distribution by 11.9% per year over the last five years. Brookfield Infrastructure Partners intends to pay out 60% to 70% of its funds from operations (FFO) and targets annual distribution increases of 5% to 9% per year. Given the strong growth runway ahead of BIP in the coming years as infrastructure investment continues around the world, income investors could likely even expect long-term distribution growth at the higher end of management’s target range. Ventas is a healthcare real estate investment trust. It invests in properties located in the United States, Canada, and the United Kingdom and is one of the largest healthcare REITs in America. Ventas earns approximately half of its revenue from triple-net leases, which are long-term in nature and have annual price escalators to help protect profits. After spinning off its skilled nursing facility properties into a separate REIT (Care Capital Properties) in 2015, Ventas owns a quality portfolio of nearly 1,200 properties, including seniors housing (55% of net operating income), medical offices (19%), specialty hospitals (6%), life science (7%), and acute care hospitals (7%). With an aging population, the demand for healthcare and senior living services will continue to be robust. The company’s properties should benefit as healthcare spending is expected to grow 5.8% annually through 2024. Ventas also has strong potential for growth in U.S. because less than 15% of U.S. medical assets are owned by medical REITs today. Compared to other industries, healthcare REITs control a relatively small percentage of real estate assets in this $1.5 trillion market and should have opportunities for continued consolidation. With a diversified portfolio of healthcare properties, one of the strongest balance sheets of any REIT, and favorable demographic trends behind it, Ventas is well-positioned to continue growing through acquisitions while paying safe, steadily increasing dividends. Ventas has paid uninterrupted dividends since going public in 1999 and increased its dividend by 8% per year since 2001. 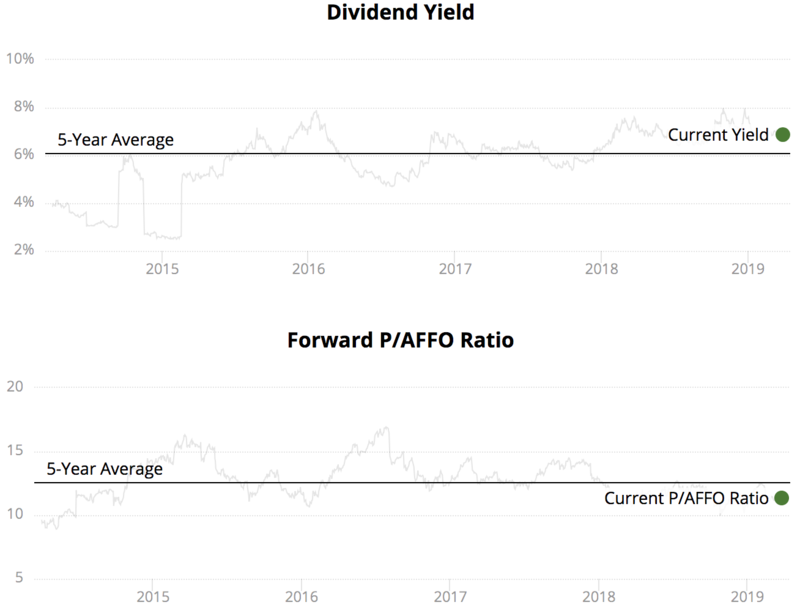 While the company’s most recent dividend increase was small as a result of its Care Capital Properties spinoff, which reduced cash flow per share, and high payout ratio, long-term investors can likely expect 5% to 6% annual dividend growth over the coming years when the senior housing market sees more of its supply get absorbed. The REIT owns a diversified portfolio of over 200 properties, of which approximately 60% are senior housing properties while the rest primarily consist of skilled nursing facilities. National Health rents these properties to around 30 healthcare operators under long-term leases with annual escalators that make the cash flow more secure and predictable. National Health Investors has a business model which is almost immune to the vagaries of the economic cycle, given that its operators provide essential healthcare services. The rapidly-growing aging population provides a lot of fuel for long-term growth, too. In fact, the 75+ year-old population is expected to double over the next 20 years. The REIT has increased its dividend for nine consecutive years and has delivered 6.5% annual dividend growth over the past decade. Income investors can likely expect mid-single-digit dividend growth to continue. Southern Company is one of the largest producers of electricity in the U.S. and has been in business for more than 100 years. The Atlanta-based company provides service to more than 9 million customers, split about equally between electric and gas. Southern Company owns electric utilities in the southeastern U.S. and has natural gas distribution utilities in seven states. Since about 90% of Southern Company’s earnings come from regulated subsidiaries, its cash flows are safe, regular, and reliable. Regulated utility businesses also require huge amount of investment in the construction of power plants, transmission lines and distribution networks. This creates high barriers to entry and low business risks because people will continue buying electricity even during a recession. Additionally, Southern Company enjoys a favorable regulatory framework in the Southeast region and operates in four of the top eight friendly states in the U.S. This helps ensure that the company will earn a fair return on its large investments. The company’s $8 billion acquisition of AGL Resources in 2016 has further diversified Southern Company’s operating assets (natural gas capacity), areas of operations (Midwest region), and regulatory risk. The combined entity has a more balanced electric and gas customer mix and bigger geographical footprint, which further reduces its risk profile while providing new growth opportunities. With that said, income investors need to be aware that Southern Company is facing a number of challenges with several multibillion dollar projects. Most notably, the company’s Vogtle nuclear plant in Georgia was challenged by additional costs and delays after a major supplier (Toshiba’s Westinghouse) declared bankruptcy last year. Fortunately, the U.S. Department of Energy announced the Vogtle project will receive an additional $3.7 billion in loan guarantees, and state commissions gave their blessing for the project to continue under Southern’s revised budget and timeline. The latest cost overrun on the project, announced in August 2018, also reached a resolution, reducing the utility's short-term risk. Investors favor utility stocks because of their safe and regular dividend payouts. Southern Company has paid uninterrupted quarterly dividends for more than 65 consecutive years and grown its dividend at a 3.7% annual rate over the past decade. Following the AGL acquisition, Southern Company is expected to grow earnings per share around 4-5% per year. This implies that the utility should be able to keep increasing its dividend by 3-4% annually, which is exactly what management did in April 2018 when the team announced a 3.5% payout raise. The company’s 17-year dividend growth streak will likely continue for years to come. Philip Morris International is one of the largest tobacco companies in the world, selling cigarettes in over 180 countries. The company was born in 2008 after Altria (MO) spun off its international operations to create this new entity. Philip Morris sells cigarettes to more than 150 million consumers worldwide and owns six of the world’s top 15 international brands. Marlboro is both the company’s and the world’s number one brand. The company’s competitive moat is derived from its ownership of the international rights of globally renowned cigarette brands such as Virginia Slims, Red & White, and Marlboro. This has allowed the company to capture a nearly 30% share of the global market and enjoy significant pricing power. In fact, Philip Morris’ annual average pricing gain has been 6% since 2008. Philip Morris has excellent geographic diversification as well, with Asia, the European Union, and EMEA each contributing between 25-35% of its total sales. This insulates the company from the imposition of strong anti-smoking laws in any single region. The company’s sole focus on markets outside of the U.S. also helped protect its stock when in July 2017 the U.S. FDA announced plans to explore lowering the nicotine allowed in cigarettes to non-addictive levels. However, in April 2018 Philip Morris slumped nearly 20% after reporting slowing sales growth for its IQOS heat sticks, which don’t burn tobacco and are expected to ultimately be the replacement of choice for many smokers around the world. The company’s long-term growth outlook is certainly murkier if this trend continues, especially as smoking volumes decline, but Philip Morris’ fundamentals remain strong and supportive of its dividend. You can read our full analysis on Philip Morris' recent underperformance and what it means for the firm's future here. Philip Morris has grown dividends every year since 2008, averaging 7.9% annual income growth over the last five years. However, dividend growth has slowed more recently to a low single-digit rate, including a 2.9% raise in 2017. To demonstrate their confidence in the business despite investors’ growth fears, management announced an accelerated 6.5% dividend increase in June 2018. Sales volumes are falling as the cigarette industry is in a secular decline, but earnings per share still has potential to grow at a mid-single-digit annual rate thanks to a mix of higher prices, lower costs, and an increasing focus on smoke-free products, which account for more than 70% of the firm’s R&D expenditure. Considering some of the growth headwinds facing the business and Philip Morris’ relatively high payout ratio, income investors should realistically expect annual dividend growth closer to 3-5% going forward. ONEOK is one of the largest energy midstream service providers in America. The firm’s natural gas pipelines and storage facilities connect to over 140 gas processing facilities across the country, making it a valuable partner for its natural gas liquids (NGL) customers. Pipelines are very costly and time consuming to construct, must comply with strict regulations, have few substitutes given their cost efficiency, and enjoy relatively stable demand since many of the products that require refined oil and gas are non-discretionary in nature. In other words, this can be an industry where the most disciplined and skilled operators generate very stable and growing cash flow (and dividends) over time. ONEOK is no exception. Management has increasingly focused the business on long-term contracts, which typically run seven to 10 years and are fixed-rate, inflation-adjusted deals to ensure steady cash flow. Less than 10% of the company’s cash flow is subject to commodity prices or volumes on its systems today, down from more than 30% in 2013. The company is very conservative with its balance sheet as well. Thanks to deleveraging efforts in recent years, ONEOK earns a stable BBB investment grade credit rating from Standard & Poor’s. 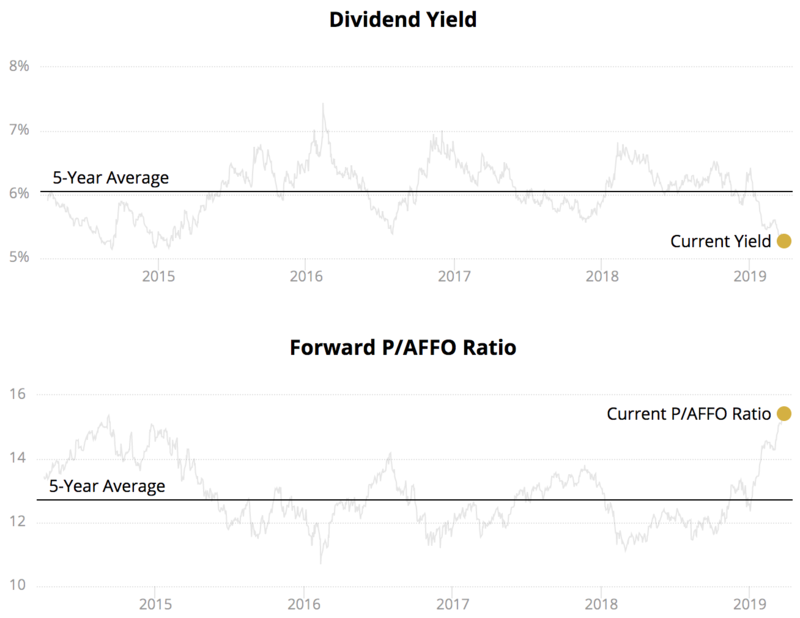 The firm’s distribution coverage ratio also stands near 1.3, which is strong for the midstream industry and helps support management’s target of delivering 9% to 11% annual dividend growth through the end of 2021. As North American energy production continues to rise and ONEOK executes on its growth backlog, the firm appears to be well-positioned to continue rewarding shareholders with generous dividends. And unlike many other players in this space, ONEOK is a C corporation that pays dividends (not distributions) and issues a simple 1099 instead of a K-1 form each year. Altria was founded in 1919 and is the largest tobacco company in America. Smokeable products accounted for close to 90% of Altria’s operating income last year, with cigarettes under the Marlboro and Middleton brands representing the company’s largest product offerings. Altria’s yield first shot higher in July 2017 when its stock price collapsed nearly 20% following a shocking announcement by the U.S. FDA. The FDA plans to regulate nicotine levels in cigarettes so that they are no longer addictive, which could accelerate the decline in smoking and crimp Altria’s profitability. Smoking has been in decline for many years, but Altria has remained one of the best dividend growth stocks on Wall Street thanks to its strong brands, excellent pricing power, continuous cost cutting, and large scale. In fact, Altria’s market share in U.S. cigarettes and smokeless tobacco is above 50%. Marlboro’s market share is even greater than the next 10 largest brands combined. The company’s supply chain, distribution system, and marketing network are unmatched, and its high market share and strong brand recognition provide Altria with excellent pricing power, which more than offsets the steady decline in volumes from lower tobacco use. Altria has increased its dividend 53 times in the past 49 years, recording annual dividend growth around 8% to 9% during the past five years. Given management’s 80% payout ratio target and Altria’s potential for upper single-digit earnings growth, the company seems likely to continue rewarding dividend growth investors with mid-single-digit payout growth going forward, at least until more information is known about the FDA’s announcement. Management appears to remain confident in the company's long-term prospects. 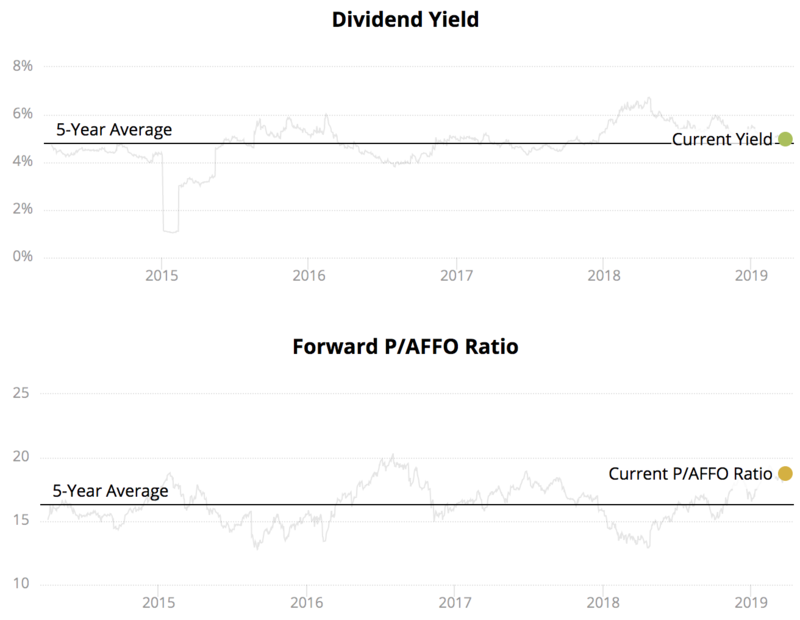 Altria raised its dividend by 8% in October 2017, announced an additional dividend increase of 6% just six months later in March 2018, and boosted the dividend by another 14% in August 2018. However, tobacco stocks could remain more volatile than in the past as investors assess the growth potential of cigarette alternatives (e-cigarettes, heat-not-burn devices, etc.) which are increasingly important as smoking rates decline around the world. In December 2018, Altria's desire to diversify its business outside of traditional cigarettes led management to invest a total of $14.6 billion into cannabis company Cronos (CRON) and privately held vaping giant Juul Labs. These moves hurt Altria's balance sheet and reduce the firm's financial flexibility. We reviewed their implications for Altria's dividend safety here. W.P. Carey is a leading internally-managed net lease REIT that was founded in 1973 and converted to a REIT structure in 2012. It is one of the oldest REITs in the world and is regarded as the pioneer in the leaseback model of triple net REITs, which is generally viewed as a lower-risk business model. W.P. Carey has nearly 900 properties leased to more than 200 customers in the U.S. (65% of assets) and Europe (35%). The company’s owns a mix of properties, including office (25%), industrial (30%), warehouse (14%), retail (16%), and self-storage (5%) space. These properties are leased out to a wide variety of sectors such as retail (18%), consumer services (11%), automotive (8%), and sovereign and public finance (6%). Unlike most of its REIT peers, W.P. 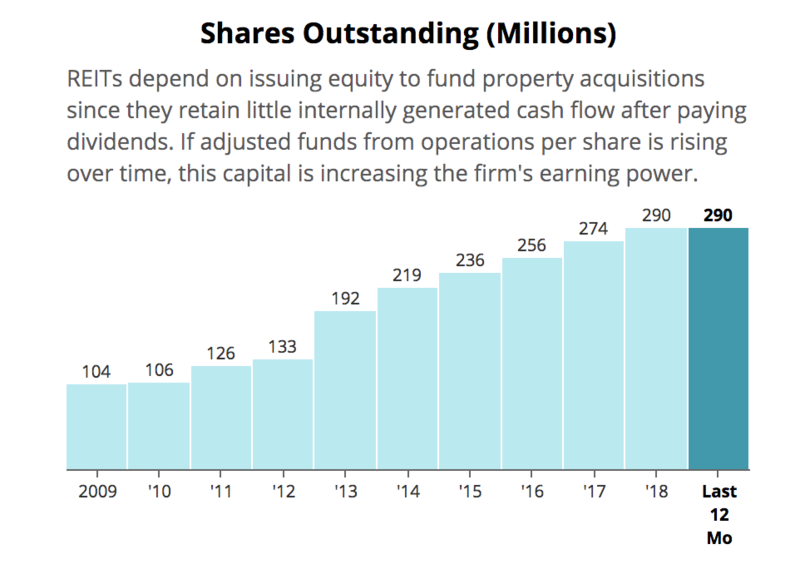 Carey operates as a hybrid of a traditional equity REIT as well as a private equity fund, which results in lumpy growth in revenue, cash flow, and dividends. Management sells properties when they become overvalued and reinvests the proceeds into more attractively priced assets. The company also operates a fast-growing investment management division, although this segment is less than 10% of total cash flow and is in the process of being wound down. W.P. Carey has a solid business model with the portfolio nicely diversified by geography, property type, and industry. As a result, the company is protected from unfavorable developments in any single industry, tenant, property type, or region. Like National Retail Properties, W.P. Carey also enters into triple net leases with customers for long periods (generally 20-25 years), leading to stable and predictable cash flows. The tenant is responsible for maintenance, taxes, and insurance in triple net lease contracts, thus saving the REIT from operating expenses. With an occupancy rate of 99.8%, an average lease term of 9.5 years, and about 60% of its leases contracted until at least 2024, W.P. Carey enjoys a very predictable stream of cash flow to support its high dividend. W.P. Carey has increased its dividend every year since the company went public in 1998. The company’s dividend has increased by 8% per year over the last decade, but dividend growth has decreased to a low single-digit pace more recently. The deceleration is likely due to the REIT anticipating an eventual increase in interest rates, so most of the marginal cash flow is going to strengthen the balance sheet so that management can continue to grow the business into the future in an era of more costly debt. 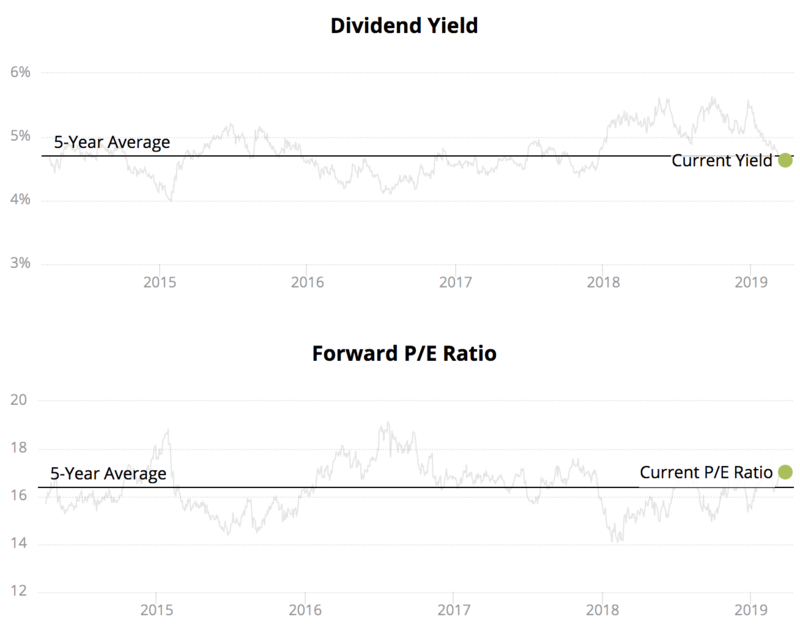 While shareholders may have to accept relatively slow dividend growth in the next few years, that doesn’t necessarily mean that W.P. 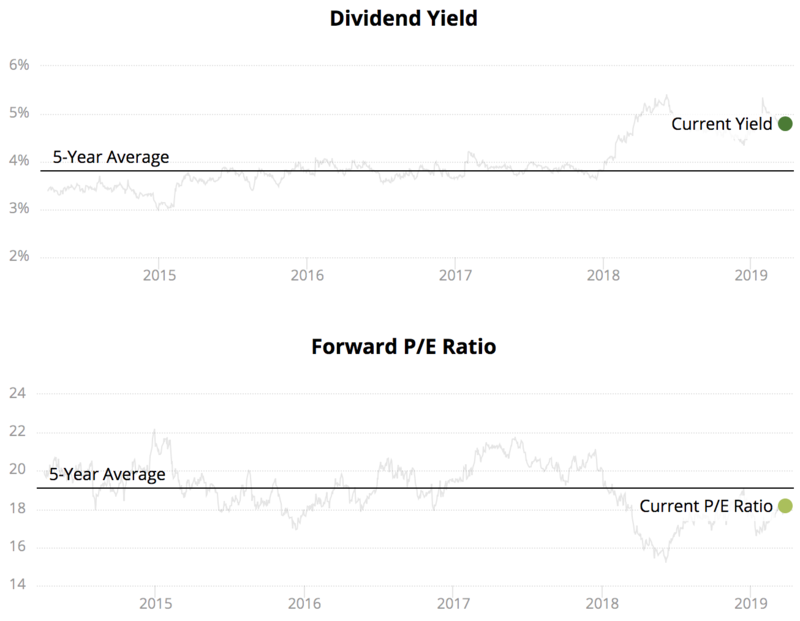 Carey isn’t a good long-term high-yield, dividend growth investment. As the company has a history of purchasing the assets it manages but does not own, W.P. Carey can likely continue growing its dividend at a rate of 4% to 5% per year over the next decade. In fact, in June 2018 W.P. Carey announced an agreement to acquire Corporate Property Associates 17 (CPA-17), a real estate company managed by W.P. Carey, in a $6 billion deal with a cap rate around 7%. While W.P Carey loses the management fees it was collecting from managing CPA-17, the deal is expected to improve earnings quality, simplify the business (reducing its investment management arm), improve W.P. Carey’s portfolio metrics (average lease term, diversification), and increase the company’s scale while preserving its credit rating. Management deserves the benefit of the doubt with this transaction. Founded in Texas during the mid-1990s, Main Street Capital is an investment firm that provides long-term debt and equity to lower middle market companies (businesses with annual EBITDA between $3 million and $20 million) and debt to middle market companies. The company provides financial services to support management buyouts, recapitalizations, growth financing, and acquisitions. Main Street Capital has $3.7 billion of capital under management and its portfolio consists of approximately 200 companies, with an average investment size of $10 million. The company’s investment portfolio comprises of lower middle market companies (45%), middle market (32%), private loan (17%) and other investments (6%). Its investments are relatively safe with more than 85% of its debt investments secured through a first priority lien. The overall investment portfolio is diversified across geographies, industries, end markets, transaction type, etc., helping insulate Main Street Capital from distress in any single company or industry sector. The firm’s other key competitive advantage is its low cost of borrowing. The company maintains an investment grade rating from S&P, and its internally-managed operating structure further reduces its costs. Main Street Capital is also not required to return its investors’ capital by a specific date, thus allowing more flexibility and potential for higher investment returns. Since its October 2007 IPO, Main Street has consistently paid monthly dividends to its investors. Impressively, Main Street has never cut its dividend or paid a return of capital distribution. The company has increased dividend at 9.9% annual rate over the last five years and most recently increased its monthly dividend by 2.6% in February 2019. The company’s regular dividend will likely continue growing at a low single-digit pace, but management frequently issues supplementary semi-annual dividends to further boost income growth. Enbridge was founded in 1949 and is the largest midstream energy company in North America today. The business is involved in gathering, storing, processing, and transporting oil and gas across some of the continent’s most vital energy-producing regions. Enbridge is structured as a conglomerate, composed of numerous subsidiary MLPs and energy funds. However, the company is more than a midstream energy business. After acquiring Spectra Energy (including Union Gas) in 2016 for $22 billion, for example, Enbridge became one of the largest natural gas utilities in Canada. The company’s primary businesses enjoy defensive characteristics that have helped Enbridge reliably pay uninterrupted dividends for more than two decades. The pipeline business is extremely capital intensive, must comply with complex regulations (limiting new entrants), and benefits from long-term, take or pay contracts that have limited volume risk and almost no direct exposure to volatile commodity prices. On the utility side, Enbridge enjoys predictable regulated returns on its investments. This is a recession-resistant industry that essentially operates as a government-sanctioned monopoly. Enbridge has solid relationships with regulators and enjoys a return on its investments near 10%, which is one of the highest rates in the sector. Enbridge has increased its dividend for 23 consecutive years (including this year), recording 11% annualized payout growth over that time. Dividend growth remains strong as management announced another 10% payout hike for 2018. In fact, Enbridge plans to grow its dividend by 10% annually through 2020 as the company plows ahead with its substantial growth projects. With a targeted adjusted cash flow from operations payout ratio of 65% or less, the company’s dividend is on solid ground and should provide plenty of financial flexibility as Enbridge pours capital into its development projects. Enbridge also does not expect a material impact to its 2018-2020 guidance as a result of the Federal Energy Regulatory Commission revised policy statement on interstate pipeline tax allowance recovery in MLPs. Finally, investors should note that Enbridge recently announced a proposal to roll-up its sponsored MLPs, including Spectra Energy Partners (SEP). Under the offer, investors in Spectra would exchange their units for shares in Enbridge. Enbridge expects the deal to have a neutral impact on its three-year financial guidance, with potential for positive impacts beyond 2020 thanks to tax and other synergies. MLPs possess a number of important risk factors to consider. Enbridge appears to remain one of the best firms in the pipeline industry and would presumably become even stronger (simplified corporate structure, cost savings, greater scale) should its roll-up plans succeed. You can read our analysis of Enbridge's buyout of its MLPs here. AT&T is the world’s largest telecom company with $160 billion revenue last year. The multinational communications and digital entertainment conglomerate is headquartered in Texas and was founded in 1875. AT&T provides mobile and fixed telephone services, data and internet services, and also pay-TV services through DirecTV. The company operates through four divisions – Communications (75% of adjusted segment profits), WarnerMedia (23%), Latin America (-2%), and Xandr (3%). AT&T has a strong competitive advantage being the second largest wireless solution provider in the U.S. The wireless industry is mature and has significant entry barriers owing to costly infrastructure and spectrum requirements. Moreover, large companies like AT&T and Verizon enjoy strong brand recognition and have huge subscriber bases they can leverage to keep prices low enough to further discourage new entrants. The company is expected to roll out 5G wireless services this year to further strengthen its market position. Unlike Verizon, AT&T has aggressively expanded its business outside of wireless services in recent years (wireless operations previously accounted for about 75% of the company’s income). AT&T acquired DirecTV for $49 billion in 2015 to become the largest pay-TV provider in the world and is focused on cost synergies and bundling its services to drive earnings higher. AT&T also won its legal battle to acquire media giant Time Warner for $85 billion. Time Warner will account for about 15% of AT&T’s total revenues and add a new business for AT&T – content. Over 100 million customers subscribe to AT&T’s TV, mobile, and broadband services, so AT&T’s bundled subscription packages and streaming services could be further differentiated with the increased content flexibility provided by Time Warner. AT&T could also enhance its advertising business with Time Warner’s assets. AT&T is the only telecom company that is also a dividend aristocrat. The telecom giant has not only been paying dividends for 35 consecutive years but has also increased payments during this period. 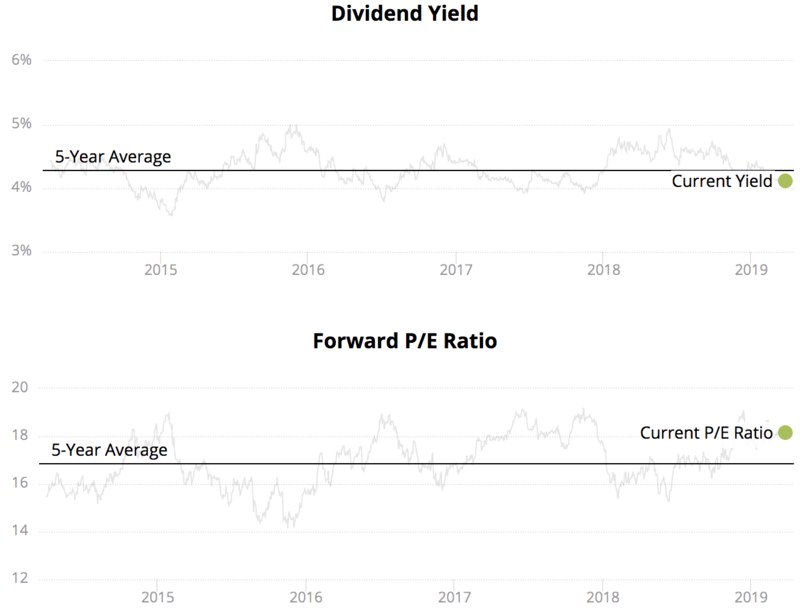 AT&T’s dividend has grown by 3.7% per year over the last 10 years and will likely grow by 2-3% per year going forward as the company digests its large deals and restores the health of its balance sheet. AT&T’s stock price has remained particularly weak since last fall as investors worried more about cord-cutting (the company reported a record traditional pay-TV subscriber loss) and the firm's rising financial leverage. While AT&T carries a very high debt load, the company appears to remain on solid ground to continue paying its dividend thanks to its excellent free cash flow generation. Management is also committed to the payout and expects to return leverage to historical levels within four years of the Time Warner deal closing. Magellan Midstream Partners engages in the transportation, storage, and distribution of crude oil and refined petroleum products. Unlike most MLPs, the partnership enjoys an investment-grade credit rating and has no incentive distribution rights, retaining all of its cash flow. The company’s refined products business accounts for 60% of total operating profits, with crude oil (31%) and marine storage (9%) making up the remainder. Magellan enjoys primarily fee-based revenue that comes from an attractive portfolio of energy infrastructure assets. Magellan’s cash flow is largely recurring in nature and offers a cushion to the partnership from oil and gas price weakness because profits are primarily driven by throughput volume and tariffs. Magellan Midstream Partners also owns the longest refined petroleum products pipeline system in the U.S. and has access to roughly half of the country’s refining capacity, providing numerous growth opportunities. The partnership also has 100 million barrels of storage capacity for petroleum products. Magellan’s strategic advantage lies in the massive transportation and storage infrastructure, which has been built over the years in strategic locations and prevents most new competition from challenging it. Magellan Midstream Partners has a strong track record of distribution growth, too. The partnership successfully increased its cash distributions even during periods characterized by unfavorable commodity prices, proving its resilience even in tough times. Magellan Midstream Partners is a good choice for long-term investors who are risk averse but want some of the high income provided by MLPs. The partnership focuses on expansion opportunities in a disciplined manner, which seems likely to continue fueling upper single-digits dividend growth. The partnership also does not expect a material impact from the revised policy statement by the Federal Energy Regulatory Commission to disallow income tax allowance cost recovery in rates charged by pipeline companies organized as master limited partnerships. In December 2018 we reviewed MMP's historically high yield here. Enterprise Products Partners is one of the largest integrated midstream energy companies in North American. It owns 50,000 miles of pipelines, 27 natural gas processing plants, 22 NGL and propylene fractionators, 14 billion cubic feet of natural gas storage capacity, and 260 million barrels of other storage capacity. The partnership also has a marine transportation business. Natural gas liquids (NGLs) transportation and processing provides the bulk of Enterprise Products Partners’ gross profit. The partnership is doubling down in this area because the shale gas boom has resulted in such an abundance of NGLs (which are used to make plastics) that there is a large, growing export market for refined NGL products in Asia and Europe. Crude oil pipelines & services (17%) and petrochemical & refined products and services (13%) are other important business units. Overall, the company has a strong business model with long-term transportation contracts and a base of blue chip customers. The partnership has business relations with major oil, natural gas, and petrochemical companies such as BP, Chevron, ConocoPhillips, Dow Chemical, ExxonMobil, and Shell. Over half of the firm’s customers have an investment grade credit rating, which makes them better able to continue honoring their contracts even during periods of depressed energy prices. The partnership also has a large, integrated network of diversified assets in strategic locations. It takes substantial amounts of time and capital to build a grid of pipelines, which results in high barriers to entry. Enterprise Products Partners’ cash flows are also fee based and long term in nature, thus making them less vulnerable to energy price volatility. With no incentive distribution rights, a solid BBB+ credit rating, and average distribution coverage of 1.2 times, Enterprise Products Partners is one of the most conservative MLPs in the sector. The company has raised its dividend every year since going public in 1998 and has increased its dividend by 5.9% per year over the last decade. Going forward, income investors can likely expect annual dividend growth of approximately 5%. Brookfield Renewable Partners LP is the renewable energy arm of Brookfield Asset Management (60% ownership), which is a major global infrastructure company operating in the Americas and Europe. Brookfield Renewable Partners business model is based on owning and operating renewable energy power plants. Brookfield Renewable Partners has over 100 years of experience in power generation. Its global footprint extends to North America (60% of generation capacity), Brazil (20%), Colombia (15%), and Europe (5%). The company has renewable energy capacity of more than 10,000 MW distributed across hydroelectricity (82%), wind energy (16%), solar (2%) and biomass energy. Over 90% of the firm’s cash flows are contracted with credit-worthy counterparties, such as utilities, primarily under long-term power purchase agreements. Brookfield Renewable’s revenue is primarily correlated to the amount of electricity the company generates rather than wholesale electricity prices, providing solid cash flow visibility. Brookfield Renewable Partners’ competitive edge is its large portfolio of assets located across growing countries. About 90% of the company’s cash flow is contracted for the next 15+ years, making for generally safe and predictable business results. With growing interest in cleaner, more sustainable forms of power, many countries are increasing their use of renewable energy. The potential for growth in the renewable energy space is exponential, with 80% of all U.S. power expected to come from green sources by 2050. Brookfield Renewable Partners could also potentially double its total generating capacity with the acquisition of TerraForm Power and TerraForm Global – two of SunEdison’s YieldCos. YieldCos can offer strong income growth potential, and Brookfield Renewable Partners is no exception. The partnership expects to distribute 70% of its funds from operations and has an investment objective to deliver long-term total returns of 12-15% annually, including distribution growth of 5-9% per year. Founded in 1951, Iron Mountain is a real estate investment trust that stores and protects all sorts of information for more than 230,000 customers. From business documents and electronic files to medical data and fine art, Iron Mountain’s services cover a very wide range. Records & Information Management accounts for 75% of revenue, followed by Data Management (15%) and Shredding (10%). Storage accounts for 81% of the company’s gross profits. The company has a real estate network of more than 85 million square feet spanning across more than 1,400 facilities (leased and owned) in over 40 countries. Developed markets represent 85% of its total revenues with the balance from emerging markets. Storage rental revenues accounts for about 60% of total revenues, while service revenue is almost 40%. A diversified customer base (95% are Fortune 1000 companies) and non-cyclical, recurring revenue are the company’s key competitive advantages. Iron Mountain also enjoys long-term customer relationships with typical lifespans averaging almost 50 years. Operating storage facilities for businesses requires little maintenance capex and generally results in high customer retention rates. In fact, roughly 50% of boxes that were stored 15 years ago still remain in storage. These factors have helped Iron Mountain consistently generate positive free cash flow over the last decade. For growth, the company is expanding in emerging markets in Europe, Asia, and Africa. It is in an advantageous position to invest in these markets because most of these countries have just started outsourcing records management and are early in the growth cycle. Iron Mountain is also investing in new businesses such as data centers (protect digital information) and ancillary services (e.g. entertainment and fine art storage). Management hopes emerging markets and adjacent businesses can account for 30% of total sales by 2020 (compared to 18% through the first half of 2018). Turning to the dividend, Iron Mountain has grown its payout by 16.4% per year over the last five years. In October 2018 the company raised its dividend by 4% and plans for a similar pace of annual dividend growth going forward. When Should I Sell My Stocks? Warren Buffett bought a new position in Suncor, sold Oracle, and added to several bank stocks. 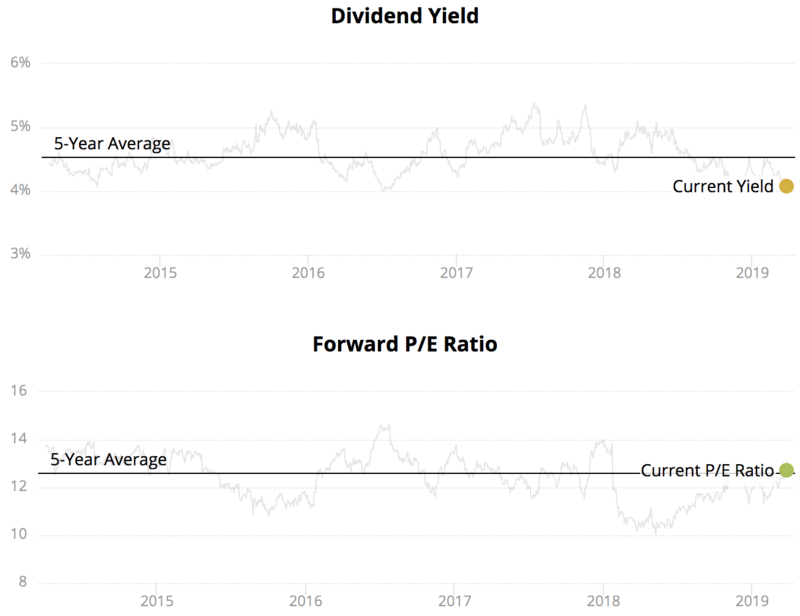 We analyzed all of Berkshire Hathaway's dividend stocks inside. Dividend aristocrats are S&P 500 companies that have raised their dividends for 25+ years. See data and research on the full dividend aristocrats list. Bill Gates' portfolio includes a number of high dividend stocks. We reviewed each of Bill Gates' stocks that pay dividends and identify the best ones. How Much Do I Need to Retire on Dividends?